Every year, we lose many Americans in tragic ways. Two kinds of these losses are likely to tug at your heart strings – the many veterans who commit suicide and become homeless each year, and the millions of shelter pets that are put down annually. Here is an organization whose mission will be sure to brighten your day. Pets for Vets was founded in 2007 by Clarissa Black, who has a bachelor’s degree in animal science. She sought out to pair the perfect shelter pet with a veteran in need, train the furry friend to be a companion animal, then bring the friends together. The training they provide is not service dog training, but teaches the dog basic obedience and how to tolerate factors like owners in wheelchairs. After the veteran fills out an application, which includes approval from a health care provider, a DD-214 copy, and interviews in person and over the phone, they are then matched with a pet. One stipulation is that you have the disposable income of $1,200 a year for pet expenses. Pets for Vets is all around the country, from the cobblestone streets of Portland, Maine all the way to the palm tree lined neighborhoods of Los Angeles. The organization still intends to grow, as long as they can find volunteers willing to take on the time commitment. One of these volunteers is Travis R. Brown, who leads the Los Angeles chapter. He is proud to be giving rescue animals a second chance at life, training for them, and pairing them with service men and women who protected our country. “I’m involved in the entertainment industry, but I’ve always been involved in rescue organizations for dogs,” Travis tells us at VA Home Loan Centers. 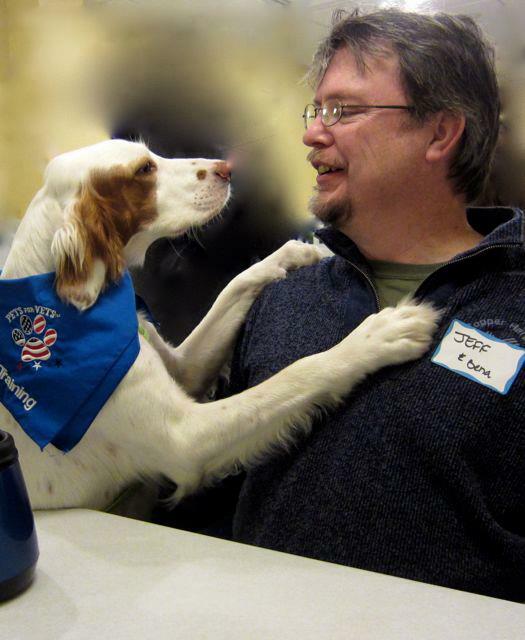 The executive of an entertainment company, like all volunteers for Pets for Vets, uses his spare time to run the chapter – his only compensation for his time is the emotional results from his willingness and desire to help. The director of the LA chapter handles incoming volunteer requests, events, fundraising and administration components. Though he didn’t start the chapter until the end of 2014, he has seen some success already. To volunteer for, or donate to Pets for Vets, visit www.pets-for-vets.com. Like them on Facebook and follow on Twitter. We are always here with home loan info with our convenient chat feature, or call us at 1(888)573-4496. Please follow us on Twitter and like us on Facebook.